It is that beautiful time of the year where you’re once again tasked with sending out holiday cards to your friends. If you are experiencing difficulty putting together the right words to include in your wishes or messages, this page would be of great assistance. Below we have freely provided a treasure trove of Merry Christmas and Happy New Year Wishes you can use in expressing your warmest wishes to your pals for the festive season. I wouldn’t even consider this time of year a holiday if I weren’t able to spend it with you. May we celebrate Christmas and bring in the New Year together in great happiness and may this happiness follow us all the days of our lives! Life is too short to let an opportunity go by without wishing you a Merry Christmas and Happy New Year. This Christmas, let us forgive all of the quarrels of this past year, and this New Year’s let us get so drunk that we forget them altogether. This year, I decided not to present you with your Christmas present until New Year’s Day, so I can kill two birds with one stone. Santa said when he stops by the house this year, he’s going to hang out all the way ‘til New Year’s Day, and of course he’s looking forward to seeing you all there! May your Christmas and New Year be full of immense joy. May you carry the joy you experience this Christmas into the New Year and beyond. It is during this time of year that I not only appreciate but miss you the most. Merry Christmas and Happy New Year. The colorful lights that illuminate this holiday season would only be half as bright if such an amazing friend like you were not part of my life. This Christmas, may we enjoy a holiday movie marathon together that lasts all the way until New Year’s Day! We may not have this much time to spend together again until next December, so let’s go all out and make this Christmas and New Year’s the most-memorable one yet! Wishing you a very, very happy Christmas and New Year. New rules: Naughty Girls get more gifts! We will spend this Xmas decorating a beautiful Christmas tree, and we will spend this New Year’s painting the town red! May great blessings from God be with you throughout this festive season. I look forward to brewing more than just eggnog with you this holiday season. Merry Christmas and Happy New Year! As Santa evades stormy weather on his way to granting us a merry Christmas, may we also avoid law enforcement on our way to having a happy New Year. The last week of December is especially dedicated to celebrating a friendship like ours, and I’m not only pleasantly expectant of being with you on Christmas but also bringing in the New Year together. May the storyline of our Christmas carol be a holiday full of appreciation and a New Year full of expectations. There is no one I would rather enjoy the cheerfulness of Christmas and the laughter of New Year’s with than you, dearest friend. May this festive season fill your heart with peace and joy. I hope that we can make this Christmas more joyous by engaging in some acts of charity at the local senior home, thus furthering our chances of also enjoying an optimistic New Year. My love for you this Christmas and New Year’s is just one short mouse click away. May each day of the Yuletide season bring you treasures of joy. Absence makes the heart grow fonder, and I plan on making up all of the time we missed spending together this past year during this coming Christmas and New Year’s. I wish you nothing short of a joyful Christmas and a spectacular New Year! May Jesus visit your house this Christmas and turn your water into wine this New Year’s. May you experience a Christmas and New Year full of warmth, friendliness and good fortune. You more than deserve these priceless treasures. May the joy we share this Christmas prove to strengthen our bond, and may we all experience prosperity during this coming New Year. I am looking forward to hosting you this holiday season and making this one of the merriest Christmases and happiest New Years any of us have ever experienced! The most-amusing holiday memories I have are the ones spent with you, but it is my goal to make this Christmas and New Year’s even more of a hoot! Rain or shine, wealth or poverty, we’re going to spend this holiday season together, and we’re going to enjoy it! Merry Christmas and a truly happy New Year! I’m expecting to see you this holiday season so that we can celebrate Christmas and New Year’s together, and you’re not required to bring anything except your lovely self! May God bless you abundantly with happiness these holidays. I hope that you enjoy a Christmas and New Year worthy of someone who is the best friend in the world. I am sending this humble yet sincere wish for a Merry Christmas and Happy New Year just to let you know that I haven’t forgotten about you, my dear friend. I wish you and your entire family, even the ones I never met personally, a joyous Christmas and an astounding New Year. Every single member of my family and I love you and wish you a Merry Christmas and Happy New Year in the warm embrace of God’s love. Have your beautiful self a Merry Christmas and Happy New Year. And remember to stop at nothing to enjoy them to the fullest. Me, you and Santa are all going to watch the apple drop together this New Year’s Day. Wishing you all the happiness the universe possesses this Yuletide. You are more than a friend to me. In my eyes, you are family, my brother from another mother, and I wanted to extend my non-blood sibling the sincerest Merry Christmas and Happy New Year’s wishes. Sending an amazing friend hearty Merry Christmas and Happy New Year’s wishes. May smiles forever be present on your face. I cannot think of Christmas without thinking of you, and I cannot celebrate the New Year without wishing you a happy one also. Thank you for being the type of friend that reminds me of the true, virtuous meanings behind the holidays. Have a blessed Christmas and exuberant New Year. Nothing makes me merrier or happier this festive season than the fact that I am spending it with a special friend like you. May the joy you give me be with you this Christmas and New Year. Just as Santa cannot enjoy the holidays without his homeys the elves, my Christmas and New Year’s will also be a bummer if the smiles of my dearest friend are not there to liven up my day. Wishing you a Merry Christmas and an extremely beautiful New Year. 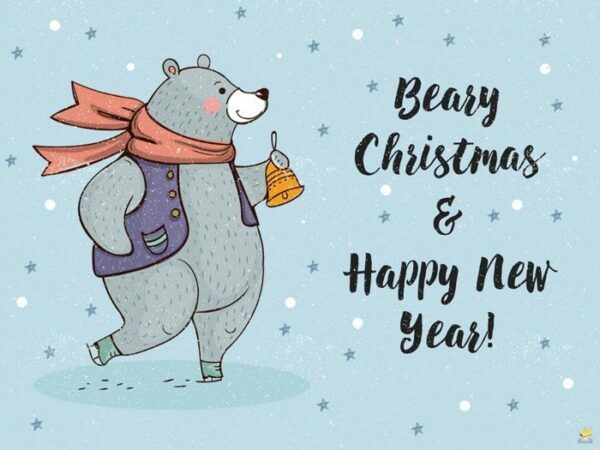 Beary Christmas and Happy New Year.